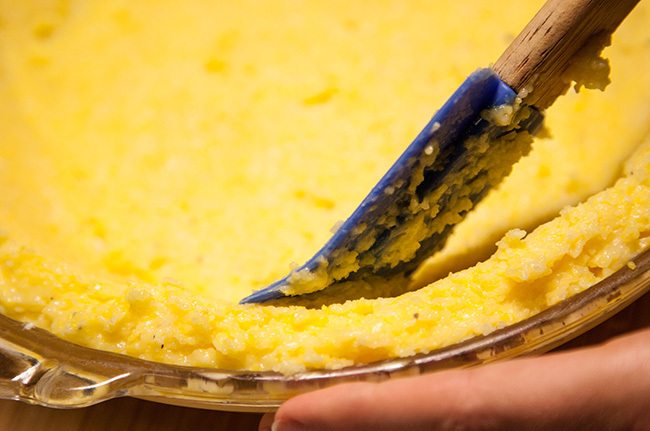 So, yeah: POLENTA CRUST. It’s exactly like you would imagine. Delicate center, incredible crunchy edges! Such a fun departure from traditional pastry, and very easy to accomplish. And oh, right, it just happens to be gluten-free too! The filling is simultaneously light and rich, owing to creamy Greek yogurt, which was a first for me in quiche-dom. I definitely approve! I didn’t have any whole milk on hand, but my 1% seemed to do just fine. I also added an extra egg to the filling because, well, I like egginess. So basically, the recipe is pretty forgiving and tough to screw up! 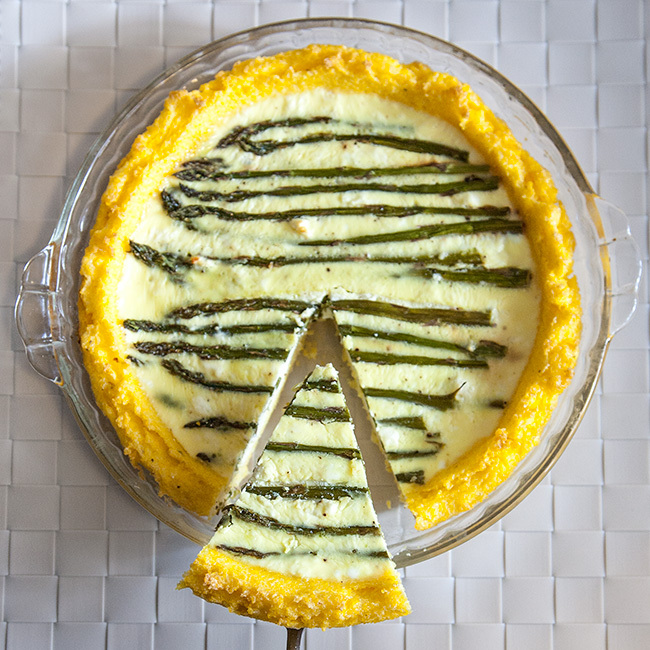 My quiche actually contains a little less than one bunch of asparagus. This is because I can’t be trusted with a pan of roasted asparagus. I just pop them into my mouth like french fries. Even cold from the fridge. All it takes is salt/pepper, olive oil, and 15 minutes in a hot oven to make these healthy green stalks completely irresistable. Seriously, you might want to pick up an extra bundle just to roast up for your weekly food prep. Your future snacktime self will thank me! We ate the quiche for dinner one night with a green salad, and then I packed a slice along with my lunch for the rest of the week. Yeah… it was a pretty good week! Preheat oven to 400 F. Snap one asparagus spear to find where the fibrous end meets the tender stalk, then use it as a guide to trim the rest of the bunch. Discard the ends and toss the spears in a single layer on a baking sheet with the olive oil, salt, and pepper. Roast them for 15-20 minutes, until tender and crisp. 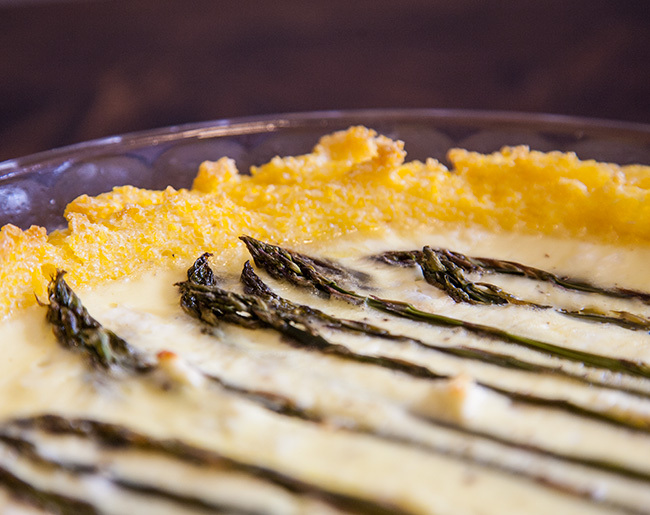 Remove the asparagus to set aside, and lower the oven temperature to 375 F.
While the asparagus roast, prepare the crust. Grease a 9-10 inch springform or pie pan, and set aside. 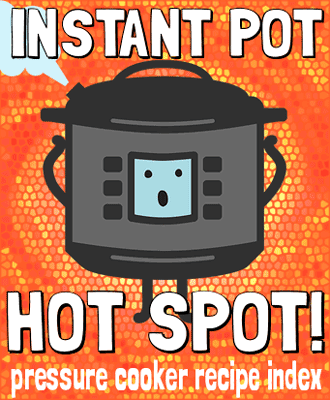 In a medium saucepan, bring the water with 1/2 tsp. salt to a boil. Slowly add the polenta in a steady stream, whisking constantly. Lower the heat to medium-low and cook about 10 minutes, until the polenta is quite thick, stirring constantly. When fully thickened, remove from the heat and stir in the butter, parmesan, salt/pepper, and egg. Transfer the mixture to the greased pan, and smooth into a roughly 3/4 inch crust using a rubber spatula. Bake the crust until golden and dry to the touch, about 20-30 minutes. Whisk together the Greek yogurt, eggs, milk, and salt/pepper, then gently fold in the crumbled feta. Pour the mixture into the prepared crust, and arrange the asparagus on top. The first spears will sink to the bottom, but just add more on top so they can rest visibly above the filing's surface. You may need to trim some spears to better fit on the sides of the pan. 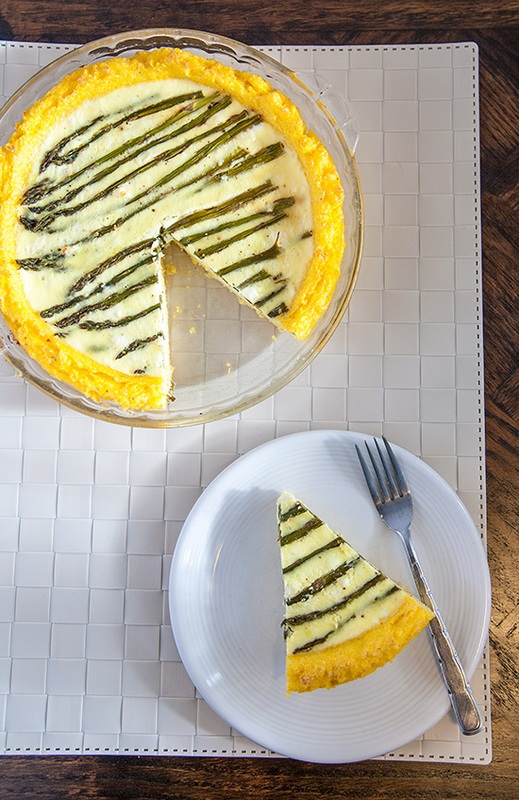 If you can't fit all of your asparagus into the quiche, save the rest for another use (or for snacking). Return the quiche to the oven and bake for 40-45 minutes until fully set, or when a knife inserted into the center comes out clean. Allow to cool at least 30 minutes before serving. Next Next post: Pick Your Own Produce: Flavor and Fun!